The MMR vaccine, stored at the Rockland County Health Department in Pomona, New York, on March 27, 2019. 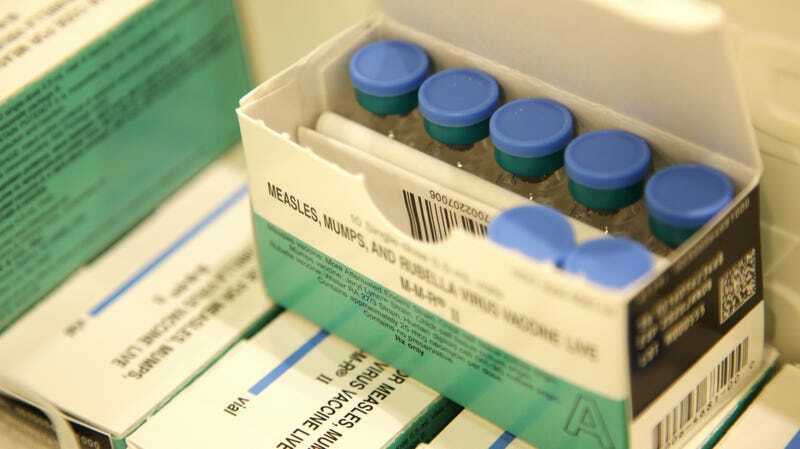 A group of five unnamed mothers are suing the city of New York, trying to get it to block a mandatory measles-mumps-rubella vaccination order city officials ordered earlier this month in specific ZIP codes in Brooklyn amid a major measles outbreak. Attorney Robert Krakow, who represents the plaintiffs, told the New York Law Journal one of the families involved felt they were forced to innoculate their two children rather than face the fine. The World Health Organization has declared the antivax movement a global public health threat, and antivaxxers have taken much of the blame for measles’ resurgence—which Ars Technica noted stands at 555 cases in 20 states so far in 2019, on track to surpass 2014's tally of 667. In any case, while the outbreak is believed to have originated among New York’s Orthodox Jewish community, the vast majority of rabbis and others there are strongly pro-vaccine—with the Times and BuzzFeed News pointing instead in part to a dedicated fringe group of antivaxxers, backed by national antivax organizations, targeting ultra-Orthodox Jews with fliers and handbooks. (A Politico report cited the rate of religious exemptions in Williamsburg at five percent; this is obviously very bad, but far from the highest non-medical exemption rate in the country.) The Times separately reported that some of the strongest pushback against the antivaxxers has come from Jewish groups working closely with health officials. “The publicity of us—the rabbinical leadership and lay leadership—telling people that you have to, by Jewish law you have to vaccinate—That is going to have the effect on those last few holdouts to basically fall in line,” United Jewish Organizations of Williamsburg head David Niederman told Politico. As Ars Technica noted, antivaxxers have filed lawsuits in response to other emergency actions. After a separate group of parents in New York’s Rockland County, which is facing a nearly 200-strong measles outbreak, successfully had courts halt a ban on unvaccinated children in public spaces, health officials simply issued another set of orders barring anyone sick with or exposed to measles from indoor and outdoor places of public assembly.